Sweet Talkin' Treats - What is French Buttercream? Many people have asked about the frostings we use. We usually stick to 3 different kinds of icings, French buttercream, Swiss buttercream, and cream cheese icing. Today, I'll walk you through the method for making French buttercream so you can get a better idea of what it is all about. This icing starts by separating eggs, as we only need the yolks. The egg yolks go in a mixing bowl and are beat on high speed while we get the rest of the ingredients going. The next step is to mix sugar with just a bit of water (the water is only used to prevent the sugar from burning) in a saucepan. The saucepan is placed on the stove over medium heat. 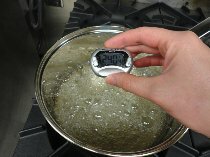 Then we brush the sides of the pan with warm water to prevent the sugar from crystalizing. When there are no spare sugar granules on the side of the pan and the sugar/water mixture is just starting to boil on the edges, we stop brushing. The sugar is cooked (without stirring) until it reaches soft ball stage, or 240 degrees F. By the way, it's called soft ball stage becuase if you were to put a drop of the sugar at this temperature into water, the sugar would form a soft ball. The cooked sugar is immediately (and very carefully) added to the whipped egg yolks, which are now light in color and thick and fluffy. The mixer is kept running on a slow speed while the very hot sugar is added (which brings the temperature of the eggs up to a safe temperature above 165 F without becoming scrambled eggs). When the sugar has all been incorporated, we speed the mixer up and whip until the bowl is cool to the touch. When the egg yolks and sugar mixture is ready, room temperature butter is added gradually. 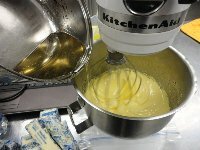 When the butter is well blended, we add flavoring (like vanilla extract, coffee flavoring, or chocolate). 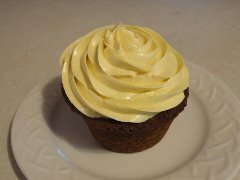 The end result is a luxuriously smooth icing with a slight yellow color to it (because of the egg yolks, of course) and a warm, buttery flavor that melts perfectly on your tongue. It is so smooth and buttery because the sugar was cooked to dissolve all granules, and then it was mixed with creamy egg yolks and always delicious butter. This icing is absolutely heavenly.